If you are suffering from headaches or chronic migraines, a disorder of the jaw joint, or the Temporomandibular Joint (TMJ), may be the culprit. Dr. Robison offers comprehensive treatment and prevention therapy of TMJ disorders. 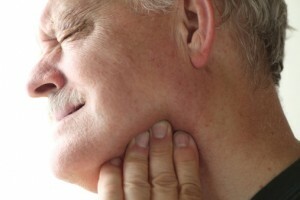 He can evaluate your symptoms to determine if they are caused by a TMJ disorder. But what exactly causes a TMJ disorder in the first place? Imagine the skull as two separate bone parts joined together by a network of joints and muscles. The lower part, or jaw, hinges upon the upper part of the skull through the Temporomandibular Joint (TMJ). When you open and close your mouth, the jaw bone rotates in its socket as your teeth part and then come back together. It’s at this point that things can go wrong. When you bite down, your teeth are supposed to come into contact at the same time. However, for some people, their back teeth might come together before their front teeth. To avoid the pain that occurs when a bite is uneven, the brain and jaw muscles compensate. The jaw bone is pulled out of its socket to ensure that your teeth come together evenly. While you’re sleeping, this compensation causes clenching and grinding, and your jawbone stays out of its socket all night. These muscles eventually fatigue and your TMJ deteriorates leading to spasms and inflammation. You might also experience clicking and popping sounds and chronic aches and pains in the head, face and neck. Early detection can prevent joint deterioration and get rid of the pain and discomfort it causes. Your dentist can customize a special orthotic plate for you to wear a night, which can stabilize the jaw joint relationship, alleviating the symptoms of TMJ disorder and preventing any further deterioration. If you suspect that your headaches and jaw discomfort symptoms could be caused by a TMJ disorder, contact Dr. Robison today to schedule a TMJ disorder consultation. Dr. Robinson proudly serves patients throughout Canton, MI community, including Ann Arbor, Northville, Westland, Plymouth and the surrounding areas. Comments Off on What Causes TMJ Disorder?